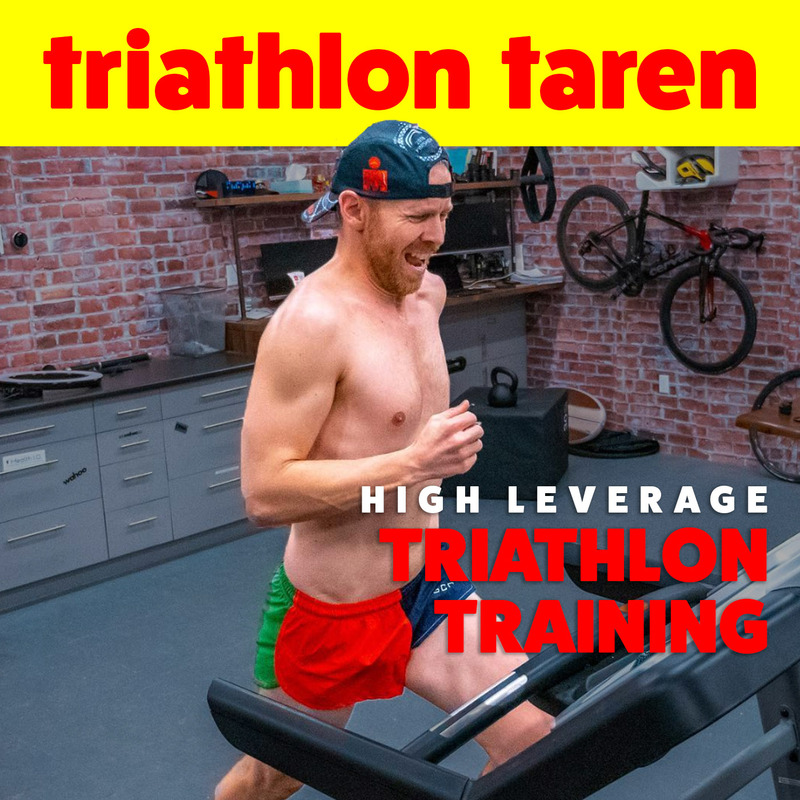 In this episode of the Triathlon Taren podcast, Taren talks about how athletes can get the highest return on their time while training, by using HIIT training (aka High Intensity Interval Training). “What’s up trainiacs? Today’s podcast guest is as we have been doing over the month of January 2019, me. That’s right, this month with a launch of Team Trainiac, cone siding with a whole bunch of new goals and new hopes and dreams that all the trainiacs are trying to achieve out there, maybe taking up triathlon for the first time, getting ready for their first event or maybe you are trying to get faster or qualify for maybe Ironman cone out or the half Ironman World Championships. Whatever it might be, there is a new focus on 2019 for a lot of you, and what we’re doing coinciding with the launch of Team Trainiac is talking about some of the training methods that are a part of Team Trainiac. “The pillars of what go into the training methods that we have put together for Team Trainiac. Today, we are talking about probably the single best return on time, ROT that we talk about, the single best return on time method of training that you can possibly do. For starters, as we’ve done before, I want you to stop for a second and picture your most badass self. This is how you think you could possibly be in your wildest fantasies like we’re talking cover of Triathlete Magazine or whatever it might may be. “Maybe it’s a romance novel, and you wanna be those big buff dudes and women that look amazing, and you wanna feel amazing. You wanna accomplish things that you never thought you could accomplish in your life. What do you look like? What do you feel like? How does training feel to you? What do you look like when you cross a finish line, and you get all those finisher pictures? What do you think you’re able to accomplish in your training? “How fast do you think you can go? How much fun do you think you’re able to have? How confident are you in the pool or in the open water? What gear do you have? Now, I want you to think about most of the people that you see crossing over the finish line in Ironman and Half Ironman races or even your local sprint, triathlon. They’re probably not looking as good in like Lycra as you’re picturing yourself in your mind’s eye when you’re picturing your most badass self. “Why is there such a huge disconnect between what we want to achieve and what people are actually achieving when we know that we can certainly end up becoming the Renee Kiley’s of the world who go from 240 pounds to pro triathlete in three years without a background in triathlon or the Tim Ford’s of the world who go from doing a 4/10 Olympic distance triathlon to searching for a 4/10 with very good chance that he’ll do it, a 4/10 Half Ironman. “How do people actually do this? Well, it separates them from the athletes who aren’t achieving their most badass selves or some genetics or some determination. There are some mind set but one certain thing is that workout prescription and lifestyle is massively different for the Rene Kiley’s, Tim Ford’s and the most badass selves of you out there who actually achieve those goals. Before we get into this method of training that we’ve decided and with careful selection after reviewing study upon study and ineffective training methods versus effective training methods and putting in a context of what we think the average triathlete is actually able to implement so that we don’t just prescribe a workout philosophy that sure, it might get to your goal but it might hurt you in the process or it’s not realistic to do because it involves 25, 30, 35-hour weeks. “I want to just touch on the global parameters that went in to selecting the training methods that we end up finally selecting for Team Trainiac. In my opinion, triathletes, age group athletes doesn’t even have to be training for triathlon but age groupers in general are limited by three main things that hold them back from reaching their most badass self. That’s their overall health, so this sleep quality. This is your weight. This is your cardiovascular system. Are your heart and lungs strong? Are your muscles strong? “Time. They’re limited by time. Just about all of us are very time restricted. We all have jobs typically. A lot of us have families to deal with or we don’t in school, and very crunch for time, and then finally confidence. Because we aren’t all coming from elite swim backgrounds as kids or track athletes as high school and college runners or elite cycling backgrounds. We lack the confidence to know that we can actually reach that badass self that we want to obtain. “The global requirements that I then said, “Well, looking at those being the main limiters where health has to come first and fitness has to come second.” I wasn’t going to choose any workout prescription that sure could make you really, really fit in the short run, but it could drive you into the ground in the long run and put your long-term health at risk. There’s a big differentiation between this. Think about Jan Frodeno just shortly after he won the Half Ironman World Championships in 2018. “Sure, he was extremely fit potentially putting out one of the best triathlon performances that’s ever been put out, but it wasn’t necessarily healthy. He did it to the detriment of his overall health. Second, it also has to have a high ROT. This is return on time that I talked about a lot. Every prescription that I give has to maximize the efficiency and the effectiveness of that workout. Because we’re also busy every single minute that we put into working out has to have a purpose, it has to be designed in such a way that there are no junk miles, there are no hours spent toiling just for the sake of toiling for future health and future fitness. Every minute that we put in has to have a purpose and a reason that we’re doing it. “Next, it has to support your inner badass. That means overall fitness, that means overall strength. That doesn’t just mean that the prescriptions that I’m going to give you are to make you a triathlete. It has to be in terms of being a total inner badass because I know that while triathlon might be a goal for a lot of you, it might not be the absolute be all, end all. Some of you might wanna dabble in the Spartan Race, or a Half Ironman, or a swim event, or do a Gran Fondo at some point, or a Color Me Rad Run or something along the lines that just shows off being an inner badass outwardly, being able to dip in and out of triathlon so we’re looking for global fitness. “We’re looking to be a global athlete that, yes, you can do a triathlon, but you can also do these other real cool events. That’s the beauty of triathlon is that if it’s done well, and not done just with triathlon in mind, you can dip in and out of triathlon. You can do any of these long endurance events. You can do adventure races. You can do Spartan Races because the nature of cross-training combined with cycling, swimming, running, some strength training, all of this together is going to make you an overall badass not just a triathlete. We wanna make you a triathlete but also a triathlete who can do other things whenever you want to. “Finally, the last global requirement is that it has to be fun. You have to enjoy it. if I’m giving you workout that you are knocking off and checking complete but you aren’t enjoying it. You’re not having any fun with it. What’s the point? Because you’re not going to survive as an overall year after year kind of badass being able to do Ironmans and Half Ironmans and build up to being the best athlete that you can possibly be if you’re not enjoying the process. “Very few of us are like Lionel Sanders who can get away with, and in joy jut grinding out workout after workout, after workout, in a basement by ourself looking at an iPad. We need a little bit more variety. We need a little bit more differentiation from workout to work out, and we need the ability to change it up when we want to. Let’s get into the training method that I wanna talk about today. “Martin Gibala is a professor who specializes in researching and publishing, and writing about high intensity interval training, HIIT training. You likely heard about this. One study that he did compared subjects who did three 50-minute workouts a week to subjects who did three 10-minute workouts a week but that was subjects that did the 50-minute workouts were only doing the 50 minutes at very moderate intensity. “Kind of middle of the road, zone three slightly intense but not really intense efforts. Meanwhile, the 10-minute workout athletes worked out for nine of those 10 minutes of very, very low intensity efforts. These are zone one and two that I talked about but one minute total of that 10 minutes was really intense. There were a total of 10-second intervals that were absolute all out efforts with small recoveries in between for a total of just one minute, three times a week at high intensity. “After 12 weeks what they found was that even though the 710-minute workout athletes were only doing 30 minutes of working out a week and really just three minutes of hardworking out a week meanwhile the other subjects were doing 150 minutes of working out every single week, five times the amount of working out, and felt much more drained because they had worked out for longer, and it was all at a fairly moderate intensity. The improvements made in both groups was identical. “That wasn’t just in that particular study. You can go and checkout the one-minute workout, the book that Martin Gibala wrote in their study after study over a period of decades showing that high intensity interval training with just a minimal amount of time can produce as good if not better results than a larger amount of moderate intensity training. Why is this? It’s because that moderate intensity, that low return on time zone three training that I talked about that is gray area training. “Sometimes it’s referred to that. Sometimes it’s referred to as black hole training, I like to refer to it as low return on time training, it is what’s most common amongst the most recreational triathlete. This is what most of us want to do because it feels hard enough to feel like we’re doing something. If we go out for a ride with friends or particularly a group run, we wanna feel like we’re working out but we can’t get into that zone where it’s just an insane smash fest because we go out and we wanna feel like we can complete the workout over a period of 45 minutes, 50 minutes, maybe hours in a row so we can’t quite get very intense. “We wanna get hard enough that it feels like we’re working, but not so hard that we end up making it difficult and not being able to complete the workout. Where this ends up getting us is in zone three. Zones one and two feel really, really easy. This is a zone that will end up getting you left in the dust. If you end up going for most training runs with a group or training rides with a group, but these zones, zone one and two, they do a huge amount to improve our cardiovascular system. “Zones four and five, they are very hard. They’re very intense. They’re hard to hold for longer than about three to five minutes but these are the efforts that end up actually making you faster, actually making you stronger, having a lot of the benefits that we’re going to discuss here today. This is what really improves yourself from the top end perspective. It pulls you up getting you closer to that most badass athlete that you think about where zone three, it’s not easy enough to improve your cardiovascular system and burn fat. It’s not hard enough to make you faster. “Essentially you’re just toiling away at this moderate intensity zone three training that doesn’t really improve you as an athlete, but it takes a lot out of your body and that is the difference between that badass self that you think about, the Rene Kileys, the Tim Fords of the world who improve and become faster and the majority of the triathletes that go across the line with a little bit of paunch maybe sticking over their Lycra bottoms, not feeling comfortable in jammers when they go to the pool. “Not reaching those goals that you wanna set for yourself whether it be speed, or distance, or time, or just the way you look because this zone isn’t hard enough to really make improvements. Here’s the wild thing about high intensity interval training. When it was studied, and they weren’t just looking at VO2 max which is commonly what researchers end up using as the measure of how to determine overall fitness is how much air your body is able to process at its peak level. “These studies also found that when they started looking at a different measure time to exhaustion, the athletes who completed high intensity interval training did see more gains. They were able to go longer than the athletes who had done the longer workouts. Now, why is this? How is this able to actually happen when you don’t just get fitter and faster, and stronger from high intensity interval training but you can also go longer while you’re not training as long as athletes who are theoretically training to go longer more than you are. “For that to understand what’s going on, we’ve got to actually understand what’s happening in the body when you do high intensity interval training. Number one, this is what’s talked about all the time is what I mentioned in YouTube videos, your mitochondrial density increases. These are the cells … To put it really simply, the cells inside your body that are responsible for energy production. If you have more dense mitochondrial fibers in your body, you’re going to be able to process energy in your limbs a lot better. “There’s two ways to build fitness and endurance. You can have central fitness, that’s heart and lung fitness or you can have peripheral fitness. That is your limb fitness. That’s your extremities and the fitness there. You’ve got to have both because you can make your heart and lungs really, really strong, really fit with the low intensity zone one and two training and be able to pump blood in your heart and lungs for hours, and hours, and hours but if your limbs aren’t able to effectively process any of that oxygen and turn it into energy you’re not going to perform nearly as well. Having more mitochondrial density it really helps us and being able to do that, allows us to end up going for longer and faster. “Also, our muscles learn how to break down fat and carbs and use it for fuel better. Whether you are fat based or whether you are carb based, these really intense efforts, they play such load on the body that your body says, “Holy smokes. I better get really good at turning at whatever energy I have available to me into energy, into actually force being the glycogen in our muscles whether it’s coming from fat or from carbs.” It is able to take both sources of energy and use it for fuel better. “Also, our muscles are able to better produce ATP. This is adenosine triphosphate. ATP is essentially … It’s energy. This is what the chemical reaction is that this is like very last thing in the chain of a series of chemical reactions. ATP is our energy once we break down fat, and carbs into fuel. ATP is what creates the energy and our muscles are better able to produce ATP as a result of HIIT training. “Also, this is a fair bit more noticeable to you, your perception of discomfort changes. I’m not gonna use the word, pain, because it’s not really pain as Lionel Sanders has described it before, a knife into your leg. That’s pain, but what we go through as endurance athletes is not necessarily pain. It’s discomfort. It’s “Oh, this doesn’t feel good. I think I should stop. I think I should slow down.” When we push ourself into these deep training zones of four and five that are really, really uncomfortable, all of a sudden, when we start going to what used to be our old race pace, it doesn’t feel so uncomfortable anymore so maybe we can go a little bit faster, maybe even a little bit faster. “It’s not just our muscles getting fitter, stronger, better, being able to turnover oxygen, produce more ATP, but even just mentally our perception of discomfort changes. Tyler Mislawchuk, an ITU athlete who’s actually from Winnipeg, here locally and I we have a friend, my friend, Tyler’s coach. I’ve ended up working with him. He’s going for his PhD and exercise science I believe it is. I’ve done a little bit of work with him and some of the studies that he’s done. “We’ve talked a lot about what the training is for Tyler now at this point because a human is able to increase their VO2 max by maybe about 20% in over the course of about three, four years in triathlon with specific endurance training. You max out at what your particular body is capable of hitting as a potential VO2 max. You do that fairly quickly but meanwhile there are all these triathletes, endurances athletes, runners out there that still continue to progress even when they’ve hit their VO2 max cap. “What they’re trying to do, what Daryl Hurrie this individual who I’ve done the studies with and was the coach of Tyler Mislawchuk at times are doing in a lot of their training isn’t just to improve their fitness, it’s to improve their tolerance for pain, and their buffering for lactic acid. It’s being able to withstand discomfort for a longer period of time and that is what’s actually allowing him to go faster and that is what we are achieving when we do high intensity interval training. Our perception of that, discomfort changes who are able to go faster for a longer period of time because our brain is mentally able to withstand it for longer. “This relates to our perception of previous efforts. All our previous efforts, they start feeling quite a bit easier and then we are able to burn fat via post exercise oxygen consumption when we go into these really deep training zones, these difficult efforts that when we finish we’re going [inaudible]. We are in oxygen debt and our body ends up burning up oxygen, accumulating oxygen over up to 48 hours which ends up speeding up our metabolism and burning fat for up to 48 hours after that workout is done. “Zones one and two very low. Aerobic intensities excellent for burning fat while you’re doing it but basically the second you stop fat burning seizes. Zone three, you don’t really burn fat anytime. It’s too hard to burn our fat as fuel at zone three because we need to push a little bit harder so fat consumption isn’t nearly as high and then when we finish because we haven’t pushed into these deep holes, we don’t have that post exercise oxygen consumption effect so zone three, there’s a reason that it’s low return on time because when you do it, you’re not burning a ton of fat, you’re not making yourself very much faster. “When you finish, you’re not burning much fat, and you haven’t really made yourself much faster so that’s why we don’t do it. The question then is why not just do HIIT training? Well, you can. A guy named Andy Magness who’s the author of Ultra Mental. It’s actually an interesting book. It’s a little bit nichey. It’s very far to the end of the spectrum of HITT training is absolutely all you need to do, but he displays that if you are incredibly crunched for time, and all you have is an hour a week like Andy has, you can still compete in ultra distance events and do so quite successfully. “Now, Andy does have a history of athleticism so he’s coming to it with basically a higher floor already but he works out just one hour a week about 10 to 15 minutes each time he goes on to a bike or treadmill and it is absolutely all out as he recommends. Do not eat before you do this because you’re probably gonna loose your lunch if you do. That’s how hard it is and he’s able to effectively compete in ultra distance events. Not just finish, he competes. “With that said, I have to go back to the global requirements of what we want to advise you to do and I think what you want to do when you picture that badass self of yours, overall health and confidence, these are the two things that just doing HIIT training I don’t think ends up achieving. While HIIT training can be effective, I think from an overall health perspective, as I mentioned there is central fitness, heart and lungs and peripheral fitness. Your limbs, your extremities. “Zone four and five HIIT training, very, very good for your extremities getting your peripherals extremely fit but it’s not necessarily as good getting our cardiovascular system as prime. If all we’re doing is HIIT training, we aren’t becoming that overall badass, overall healthy athlete that can go into any event because we have a weakness that we haven’t necessarily worked out our cardiovascular system extremely well. It’s also tremendously taxing on the body especially if it’s not structured in a week carefully. “Because it is so intense, and it’s hard to get into those zones four and especially five, it’s very difficult to get into that for any period of time. You have to be really, really fresh and if all you’re doing time after time, after time, after time is HIIT training it’s going to be very difficult on your body. You might even get injured because you just keep going to the well over and over and over without any recovery workouts, without any low intensity workouts, without the support of your heart and lungs to really help you along because you haven’t really worked them out at all. “Then as far as confidence goes, how many of you would be able to work out for just one hour total over the course of a week and then be able to step up to the start line of an Ironman race and feel it all confidently you’re going to be able to work out in one day for upwards of eight to 17 hours? Probably not going to give you a lot of confidence so while you are actually able to do it, physiologically yes, you can do it, I think it lacks those health changes that we want to give you, that overall lifestyle badass attitude that you wanna have and that then relates in to the confidence. “Are you going to be confident in all of the races that you wanna take on which then is going to trickle into being confident in life? I don’t necessarily think that you do. You need both the HIIT training and the low intensity zones one and two to have that overall health effect that I wanted to achieve for you. How do you actually incorporate HIIT training into your workout? Well, I’ve talked about 80/20 training before and 80/20 Triathlon Training, very good book for anyone to pick up, is it’s the basis for how we break down the training on Team Trainiac. “Everything is automated so that basically no matter which menu of workouts you select and which days you decide to do workouts because it’s all driven by you on Team Trainiac. We don’t just have template training plans. We let you select which workouts you wanna do on which days and how many workouts you do, it’s all customized that way, but it’s done in a way that basically no matter what recipe you put together through this menu of workouts, it works out roughly to around 80% of your time spent in zones one and two, and 20% spent in high intensity zones. “How you achieve this is that weekend rides and runs or maybe you’re a shift worker and your endurance rides and runs the longer efforts are during the week, whatever it is your endurance efforts. They’re fairly low intensity but you accumulate a ton of time in it. If you spend four hours on the weekend at a fairly low intensity ride, and you’re only working out 10 to 12 hours total over the course of an entire week, right there, boom you have anywhere from 33 to 40% of your time instantly spent in the low intensity zones, the 80%. “Our longer workouts are those lower intensity 80% zones one and two cardiovascular, central fitness building workouts that do take more time to end up getting the return on time that we’re looking for out of it but where did those 20% come in? Well, if we start looking at HIIT, High Intensity Interval Training across each discipline on the swim that don’t actually recommend high intensity interval training on the swim. Swim is so technique based that I bet if all of you went out and let’s say you swim a series of 20 100 meter or yard efforts and every single interval, you ended up increasing the effort and we’ll just use this scale really easily from 50% effort to 55 to 60% effort, to 65% effort. “What you’ll find is that somewhere around 85, 90%, you are pushing out a huge amount more power but you might not be getting much faster because swimming is so much more about efficiency than it is top end speed. We wanna do almost all of our swim training with really good form and ingraining those good muscular patterns that we need to, to swim well. “You look at any master swim group and you go down to the end of the road in the fastest lane possible, I guarantee you there’s going to be at least one if not two of those swimmers that are cranking out some incredibly fast times that aren’t very fit. You look at them and you go like, “Oh my god. How are you in the fastest lane?” Well, it’s because it’s so technique based. For most of us, age group, amateur triathletes, I don’t recommend doing any work besides some really controlled, really purposeful work that is structured properly in a swim workout for a small portion of it as high intensity work, but I don’t recommend doing any solely dedicated, “All right. This is a HIIT training kind of swim. I’m gonna go out there, and it’s gonna be just 15-minutes long and I’m gonna absolutely blast every single minute of it.” No. “I don’t think you’re gonna get much out of that. We’re looking for high return on time and doing that in the pool isn’t going to result in the outcomes that you want. As far as the run goes, yes, you can definitely do high intensity interval training on the run, but you’ve got to be quite careful if there’s a place that we get injured as triathletes. It’s on the run so you’ve got to listen to your body. You’ve also got to structure the run in such a way that you’re gradually building into being able to do that high intensity. As some people do that go and just do a 10-minute treadmill workout and to go from zero to boom, super intense on the treadmill, that’s opening yourself up to a fair bit of injury and we’re looking at, remember, one of the global requirements I have to keep you healthy. “I can’t make you fit. I can’t get you to your goals if you aren’t free of sickness, free of illness, free of injury, and we’ve got to be very careful about how we structure those workouts. Yes, HITT can be done in running works but it’s got to be done very carefully. The bike, this is your place to do HIIT training. You can be extremely safe on the bike while going absolutely all out. I would actually recommend if you really wanna go all out, all, all, all out, then you’re losing your lunch going all out really getting the most out of HIIT training that you possibly can. “You have one work out a week that is on a bike, on a trainer that is in a safe scenario so that if you end up falling over the side, “Hey, you just did a really good interval.” It’s not like you’ve fallen off the side in the middle of a pack during your group ride, if you’re gonna end up doing that, you’ve got to be a heck of a good rider. I like doing really intense rides with a group but I know that because it’s with a group and there’s actual danger, a lot of the efforts that I give when I try to reach peak efforts with a group, I’m hitting maybe 800 watts in a really good day. “Not 900-920 watts that I might be able to HIIT by myself. Bike training is where you really want to have your HIIT workouts. Now, also as the season progresses, how do you incorporate HIIT training? Along way out from the race, the HIIT training is exactly what you might read and expect from a book called the One-Minute Workout. These are eight to 30-second incredibly hard efforts but as the season progresses, we go and gradually start moving our way up. “We start increasing the length of those efforts up to maybe three, four, five-minute efforts, so the zone a long way out from your race season is very high zone five. Peak efforts building your top end of fitness as hard as possible and then gradually as the season progresses we can make those efforts harder by building up the number of reps. We can increase the length of the interval or we can shorten the rest interval and all of these things we play with on Team Trainiac are agilely progressing people from those short eight to 30-second hard efforts all the way up to a three, four, five-minute hard effort that is slightly less zone five and a lot more zone four working more on your high end VO2 max kind of stuff. “Last thing, HIIT and HRV. Now, I talked a lot about heart rate variability and what you’re looking for with heart rate variability is it’s a measure of how ready your body is for really hard work. This is a really big day or really intense day. Heart rate variability is the variation in the amount of time between your heart beats. Let’s just say for easy numbers, you have a heart rate of 60 beats per minute. That doesn’t necessarily mean that your heart is beating every second on the second. Boom, boom, boom, boom, boom, boom. “It’s actually a fair bit variable, so boom, boom, boom, boom, boom, boom, boom. What you want is high variation because that means that your heart is only beating when it’s required and what happens when we start getting into a more stressed state so when we’re exercising, it starts getting more rhythmic, boom, boom, boom, boom, boom. If we carry that more rhythmic heart beat into our day to day lives and when we’re resting and when we’re sleeping, it’s like our heart is just trying to hang on. It’s hanging on for dear life and it’s gone very rhythmic to actually keep beating but we want a high amount of variation. “When we start looking at heart rate variability we want high heart rate variability numbers and you can go to triathlontaren.com/hrvtraining where I have a free download that you can get and you just punch in your email address and it walks you through how to do heart rate variability with either a 10 to $15 app or an Oura ring, all the products that we use. You can do it for as little as, I think with HRV for training, it’s $14 Canadian, $10 US. You can effectively manage your training based off of heart rate variability. “Anyway getting back to heart rate variability as it relates to high intensity interval training, if you are using heart rate variability you end up reserving your really intense, high intensity interval training, you’re really hard days, four days where your heart rate variability is quite high. Your body is ready to produce a really hard effort and then recover from it after. “If you’re not using heart rate variability just start listening to your body on days where you don’t feel very good, where you didn’t get a good sleep, where your schedule is fairly busy, where you’re just struggling to really work in a workout period. Probably not a good day to do really intense runs. You might be able to get away with an intense bike but you don’t wanna risk that on an intense run where you might end up being susceptible to injury. “We want to reserve those high intensity interval days for the days where we are very well prepared for it. When I go back to looking back at the main limiters of most of us athletes to become our most badass self and getting the right workout prescription and overall training methods that we implemented with Team Trainiac, we were looking at keeping people healthy, giving them workouts that was time efficient and building their confidence. It had to have their requirements that health came first, fitness comes second. “It has to be high return on time spent. It has to support your inner badass so that you can outwardly compete in any race possible because you’re overall a good athlete that has to be fun. When we start looking at HIIT training in relation to that, does it support your overall health? Yes, especially if you’re doing it selectively and maybe during some weekdays where you have a little bit less time, but also incorporating with the 80% of the tome that you’re spending in zones one and two really, really critical. This is building you into an overall good athlete. “High return on time? Absolutely. With a 20-minute workout, with a 10-minute workout, with a 30-minute workout you can get a great workout then, and this is what I recommend for people that they do. Their long, slow distance efforts, the aerobic conditioning, the zone one and two training on the weekend when they’ve got more time or when you’re crunched for time, you’re just trying to fit in a workout early in the morning, do some high intensity interval training sessions that you can just fit in the morning really, really easily and get a huge benefit from it. “Is it going to support your inner badass? Absolutely. If you get on a bike and you crush out a session that you are afraid of before you actually got on to that bike, you’re gonna be able to think, “I can go into a Spartan Race. I can go into a 5K race. I can go into a Half Ironman. If I can get through this and put out that kind of effort, meanwhile everyone else is just namby-pamby jogging around, yogging around, but you are absolutely cranking out watts and pushing to the absolute max, you’re gonna build a huge amount of confidence. “It’s also going to be a lot more fun. You don’t need to science up your fun on you but they actually did start looking at studies of how much fun did people have when they did these studies and they start asking the athletes who did moderate intensity training. How long do you think you are actually working out? On average they actually said that they were working out longer than they did whereas the high intensity interval training athletes actually under estimated how long they had actually been working out. “They thought it went by quicker. They stuck to it more because they were having more fun. It’s accomplishing all of these things were building your health first while building your fitness but we’re keeping it healthy in the meantime. You’re spending every last minute of your workout, getting a return on the time that you were spending. You’re building yourself into an overall better athlete and you’re having a lot of fund in the process. “Where do you from here? Well, Team Trainiac has a good start. We are very partial to the training methods that we’ve selected for these reasons that we are looking at the highest return on time methods that you can possibly use. You can go there. If it’s not already live you can go to traithlontaren.com/teamwaitlist and be notified just of when it’s out. That’s just subscribing to the email list of notifications of when Tam Trainiac is available because at the moment we’re in a testing phase at early January but it’s going to be available to the public very, very shortly. “You can also go to that landing page just to get the free downloads about how to implement all the zone training at triathlontaren.com/hrtraining and that takes you through all of the variations of how to use the 80/20, and the HIIT, and the low intensity training and why to stay out of zone three a little bit more information about what we’re talking about here. If you want to talk about HRV and learn about that, you can go to triathlontaren.com/hrvtraining and learn about that. “If you wanna get any of the resources that I talked about as I mentioned before I don’t like just sending you to a whole bunch of studies because you got to sift through those and it’s very dry reading rather I’d send you to an actually curated book so a couple of things that I’ve mentioned, the Ultra Mental book, the One-Minute Workout book, a link to Ben Greenfield’s part one and two. These are chapters from his book. We’ll link to that in the show notes at triathlontaren.com/hiittrainingpodcast. That’s HIIT with two I’s, HIIT training podcast, and all of that will be there.